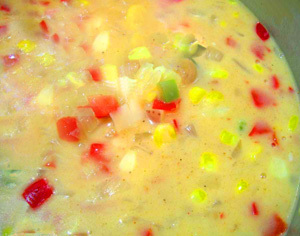 One of the best soups in the world is "Corn Chowder" at least my corn chowder is best! It's great with my homemade bread (link) especially made into clover-leaf rolls. You are probably saying why does she think this is "her" recipe? Well, I did make it up. I ate lunch with my family down at La Familia Diaz and everyone loved it so much, I went home and figured it out. It can be spicy or bland, but filling your tummy for sure, especially with homemade bread. The main reason that I'm posting this is because it is a good soup or at least the base, for "stroke-victims". The creamy chowder base is thick. No thin soups for those that have trouble swallowing. This can be easily converted to potato chowder, or a sauce for so many vegetable or vegetable and meat additions. Actually, I've used it to thicken different casseroles. All around, the white gravy is perfect and can be easily changed to the amount of people you have to feed. I have to write this down....Steve and I don't have this a lot. I have this thing about corn, I do love it, but it's what persons feed livestock to make them fat. Sooooo, simple thought. It's a very, very good gain, weight-type food. If you're skinny- flaco. This is your soup! This is great for company because it feeds so many and can be made in half an hour, start to finish. And, it uses up the can foods. Don't knock that because we need to rotate our can foods if we are doing the "year's supply" commandment from the Fire Captain/ Emergency Preparedness Coordinator for the city, the county fire, and for the church. And that is my dear husband! The bread or rolls are made in advance and warm. All the cans are opened, with the chili and pimentos drained. I start by heating the milk with the grated onions so they have enough time to reconstitute. The milk may heat too fast and it will very easily scold or burn on the bottom of the pan. Honestly, you need to use a big heavy pot or very well-made of heavy gauge material and so that the bottom of the pan is thick. A thin bottom is a recipe for disaster because these type of pans often transmit heat unevenly and develop hot spots. I make this carefully without burn places because the brown spots of burn milk look unappetizing. Guess you can add some canned mushrooms if that happens, but fungi? This thick sauce will stick to the bottom and burn suddenly because there is this magic temperature that will make the stock turn very thick, if your attention is somewhere else. The flour and melted butter need to be blending together in another saucepan and the mixture needs to be smooth and cook slowly as well--well, some slowly. I add a cup of very warm milk to the flour/butter mixture from the heated milk and whisk this around be sure that this is all smooth with no lumps. The steaming milk then just calls to the butter/four mixture. Add the butter and flour mixture to the soup base of the milk and dried chopped onions and yes, it gets thick quick. Another trick is not to go too long with the thickness or you might "break" the soup. It's a bit like separation. I've never seen this, but know this can happen. Okay, we have thick gravy and now add all the other ingredients. It is smooth and wonderful. It may need more salt for blue collar workers like my husband. Pepper is great and makes the soup look finished. The corn adds a lot of bulk so the whole "Kit and Kaboodle" will become a large, large pot of soup. Missionary Elders that come over for dinner will love to take this soup home and usually have it for breakfast. To make this smaller: Just cut to half ingredients and if needed smaller amount or portions, cut it again. Easy because all the ingredients are so even. For my mom, we had to find others around to share. Yes, I made enough for an army and thankfully, my Marnie and her family of six, happened by the house. The soup was happily gifted to her. BTW, this soup freezes really well in a freezer zip-bag. Now, I haven't ever done that because it always gets eaten. Food: Fast and Furious!